This is the first 1991 Spanish edition of Coyote Waits, which is the tenth Tony Hillerman Navajo Mystery novel. 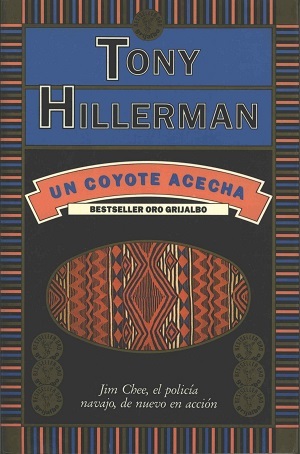 This paperback edition was published in Barcelona, Spain by Ediciones Grijalbo, S.A. Tony Hillerman’s original English text was translated into Spanish by Maria Antonia Menini, and the title directly translates to “A Coyote Stalks”. The cover art was designed by Enric Satue, and features a Navajo blanket pattern within an oval. Format: Paperback, 20 x 13.2 cm. Binding: Full-colored paper covers with the author, publisher's logo, and the title printed vertically on the spine.